Here is a guest blog I wrote for Miss Laurel Ann at Austenprose 🙂 Thank you for hosting me Laurel Ann! Have a great Friday! Gentle readers: We are happy to add the story of another conversion to Jane to our monthly column, Reading Austen. 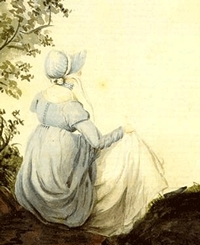 Today’s guest blog is by Emma Mincks, who shares her personal story of how she discovered Jane Austen and why she is passionate about defending her. My love affair with Jane Austen’s storytelling began early. I watched the Gwyneth Paltrow adaptation of Emma in eighth grade. At the time, the melodrama and internal conflict that Emma experiences during her discovery of love for Mr. Knightley resonated perfectly with my teenage angst and misunderstandings of love. It also didn’t hurt that the musical score was beautiful, that Emma was a painter (so was I), that she tried hopelessly to set up all her friends (so did I), or that she and I shared the same first name. Hello, there, I frequently read Austen, and I have the whole series of novels as adaptions by the BBC, which I watch every winter. I have often wondered how Lizzie Bennet’s life would go, considering the enormous social and economic changes that were on the point of starting in Britain. There were wars, too, I wonder if her children had to serve in the forces, did they make it home. The dissolution of the big estates, from our place in history, has been a mistake. The value in the land and those who knew how to husband it should have been maintained. Anyway, there’s a good book to be written about all that. Kristin.